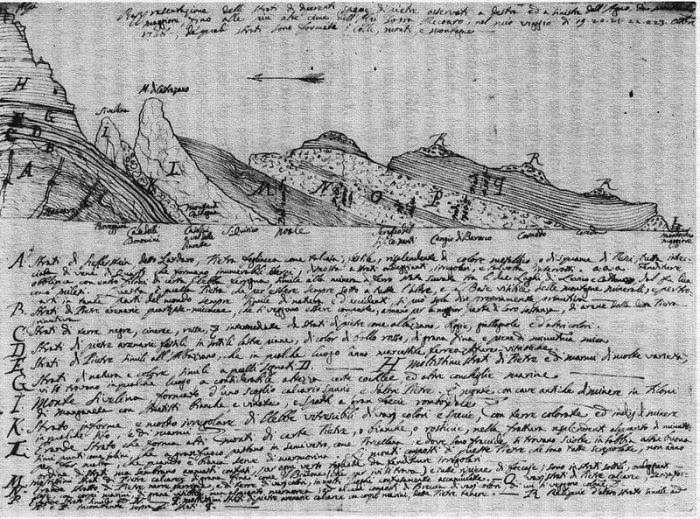 In a letter dated to March 30, 1759 the Italian mining engineer Giovanni Arduino (1714-1795) proposed to the physician and fossil collector Prof. Antonio Vallisnieri the subdivision of earth’s crust in various types, or layers, of rocks. Based on his observations along the foothills of the Alps, Arduino recognized a stratigraphic column with four rock-layers: unstratified or poorly stratified crystalline rocks (or “Primary Rocks“, survived into the 20th century as “Paleozoic“ epoch), stratified rocks (“Secondary Rocks“, or “Mesozoic“), more recent, as yet unconsolidated, sediments (“Tertiary Rocks“) and finally all volcanic rocks. Arduino used a section of rocks exposed in the Val d´Agno to explain his classification scheme. The numbers refer to the thickness of the strata, the letters to the description in the accompanying text. The extremely tattered state of the original drawing suggests that Arduino demonstrated it repeatedly to the many naturalists who visited him.